From show stopping cakes to royal influences, we have all the inspiration you need to plan the wedding of your dreams. Planning a wedding is undeniably fun, but it can also be hard work. With so many options out there, it can be difficult to know where to start, and it’s all too easy to become overwhelmed. Luckily, we’re on hand to round up some of the hottest wedding trends, which will offer some much-needed inspiration to help you plan the wedding of your dreams. It may be almost a year since Meghan Markle and Prince Harry got married, but their wedding, along with that of Princess Eugenie and Jack Brookbanks, is still serving as a source of inspiration for many couples. Understated glamour is the order of the day, with elegant decorations and simple yet stunning wedding dresses combined with statement accessories. Like Harry and Meghan, you could even introduce a signature scent with the use of scented candles or oil burners. Statement lighting can make all the difference to the look and ambiance of a room, so be sure to take this into account when planning your decorations. For a cosy, romantic atmosphere, adorn the space with flickering tea lights or vintage style candelabras. Fairy lights also work really well, particularly in a barn venue; create a feature wall of light with a fairy light net, or, for a subtler effect, wrap lights around beams and window frames, or pop them in glass vases as alternative centrepieces. Bold, bright flowers are a huge wedding trend this year, and it’s a trend that looks set to stick around for a while yet. Incorporate this trend into your own wedding with colourful bouquets and centrepieces, a romantic flower wall, and floral prints for your bridesmaids and groomsmen. This bold look is echoed in this year’s colour schemes, with deep bright colours such as coral, violet and sunshine yellow taking centre stage over more muted nudes and pastels. When it comes to decorating your wedding venue, the ceiling can often get overlooked, but with a bit of creative thinking, it can add the perfect finishing touch to your dream venue. A ceiling net of fairy lights is great for creating a romantic, whimsical atmosphere, while pretty vintage bunting is perfect for a rustic, summer fete-themed affair. Alternatively, add bold splashes of colour with large paper lanterns or pom poms. The trend for understated, naturalistic cakes is officially over. Instead, this season is all about bespoke, show-stopping wedding cakes. Go all out with opulent, extravagant designs featuring gold and silver detailing, intricate piping, pearl or crystal decorations, and even personalised monograms. There’s no such thing as too much, so push the boat out and let your imagination run wild. 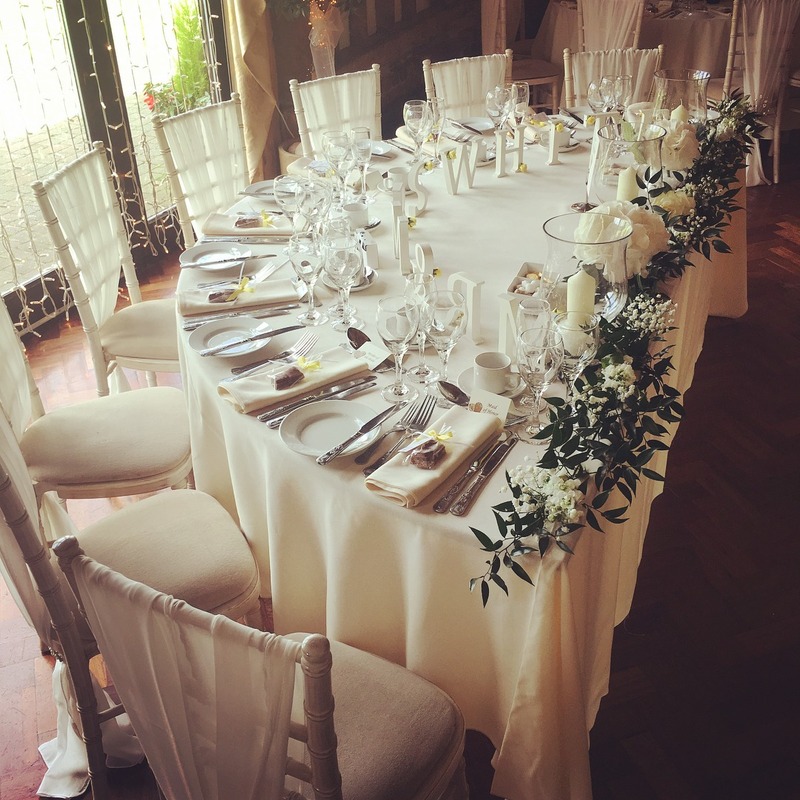 In recent years we’ve seen a growing number of couples moving away from the traditional three-course wedding breakfast in favour of more informal arrangements such as communal sharing platters, grazing stations, afternoon teas, and even gourmet BBQs. It’s a great way to introduce a relaxed and casual feel to proceedings, and it can also offer you more flexibility when it comes to the running order of the day. 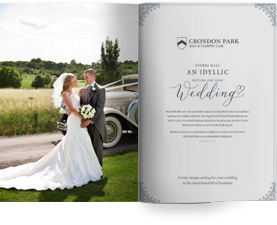 Hopefully we’ve helped to spark some inspiration and get you started on planning your big day. As one of the premier Essex wedding venues, we’re experts in helping couples to realise their vision. So, get in touch today and let us help you plan the Essex wedding you’ve always dreamed of.